Jay - Jay Okocha thinks his nephew Alex Iwobi should stay and fight for a first -team place at Arsenal rather than leaving on loan . After regularly starting earlier in the season , Iwobi , 20 , has found opportunities harder to come by in 2017 . But former Bolton midfielder Okocha , who will be playing for Nigeria at the Star Sixes tournament at The O 2 in July, thinks staying at Arsenal would be best for Iwobi . “ We can ’ t forget that this is his first full season in the first team and Arsenal have all their players back now. There ’ s a lot of competition, so it’ s not easy , ” he told Sky Sports . “ He has had a good season . It’ s not easy to make it through from the academy into the first team at such a big club. He has achieved this and has been phenomenal ; I am delighted with what he has achieved so far . 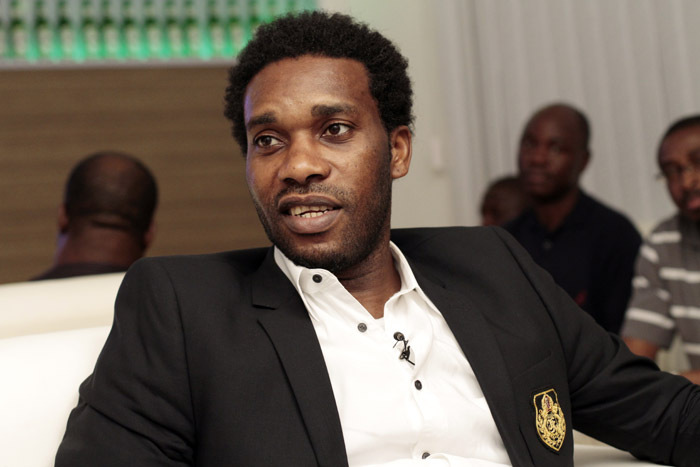 Okocha will be one of a host of former Premier League stars competing at Star Sixes in July. Steven Gerrard , Carles Puyol, Michael Ballack , Deco and Robert Pires will also be in action at the indoor six - a - side tournament . “ I ’ m very excited for it, ” said Okocha . “ I think I will be in my comfort zone . “ Everybody is looking forward to showing that we can still play a little bit. There are a lot of good players and it will be interesting .